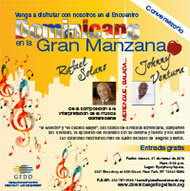 As part its regular Dominican get-togethers in the big apple, On March 21, Global Foundation for Democracy and Development (GFDD) will celebrate the Dominican Republic’s rich and distinct musical rhythms by showcasing the lives, careers and sensational talent of singers Johnny Ventura and Rafael Solano. The charismatic and talented musicians, widely known as El Maestro” and “El Caballo Mayor”, respectively, are legends of the Dominican and international music & entertainment scene. The duo will take to the stage to recall the joys and successes of their magical careers, spanning more than four decades. Don't miss this exciting event to celebrate the pairs' achievements and enjoy a wonderful and thrilling evening of dynamic stories and uplifting music from the Dominican Republic. Date: Friday, 21 March, 2014 @ 6:30 p.m.
Dominican Get-togethers in the Big Apple, always free and open to the public, are part of the mission of the Global Foundation for Democracy and Development (GFDD) to promote an understanding and appreciation of Dominican culture, values and heritage, and to create opportunities for discussions of issues relevant to the Dominican society in the homeland and abroad. The GFDD reaches out to the Dominican community living in the New York metrolpolian area, and elsewhere, and to all those interested in Dominican culture.